The Xbox One's new slogan gets an E3 banner reveal. We've got a short while to go before Microsoft gives its E3 presentation - hopefully ending the speculative round of crash-and-burn that followed its last reveal - but before you go gently into that good Expo, here's a tidbit. 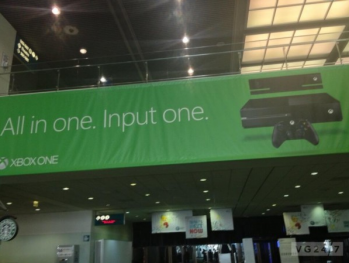 Microsoft's slogan for its new console has had a great big banner reveal at E3. Think you'll be able to Input One? Microsoft's all in one console has had a rough ride of late, what with concerns over DRM, used games, that always-on Kinect, and so forth. Recently Microsoft announced it was cancelling its post-presentation E3 question-and-answer, allegedly because of schedule conflicts. Or possibly the execs who would have been in on that Q&A had some Ones to Input, who knows. More from the world of Xbone later on, when the E3 presentation kicks off.